sinks Archives - HexByte Inc.
Microsoft has sunk a data centre in the sea off Orkney to investigate whether it can boost energy efficiency. The data centre, a white cylinder containing computers, could sit on the sea floor for up to five years. An undersea cable brings the data centre power and takes its data to the shore and the wider internet – but if the computers onboard break, they cannot be repaired. Orkney was chosen because it is a major centre for renewable energy research. 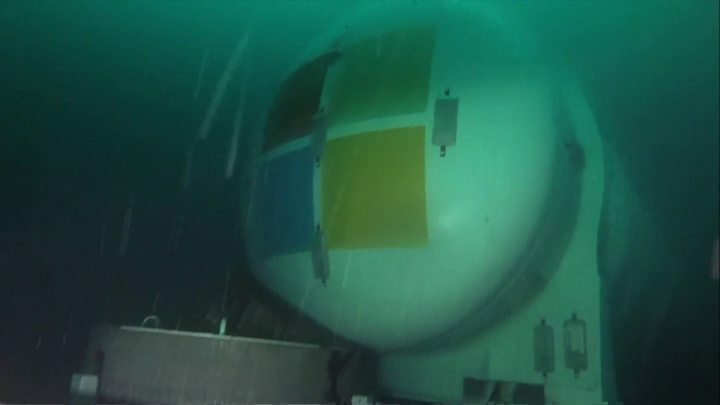 Microsoft’s first experimental underwater data centre, sunk for five months in 2015, was dubbed Leona Philpot after a character in an XBox game. If Project Natick proves a success, Microsoft envisages sinking groups of five of these cylinders and being able to deploy a data centre offshore in 90 days, whereas it could take years on land. The operation to sink the Orkney data centre has been an expensive multinational affair. The cylinder was built in France by a shipbuilding company, Naval, loaded with its servers and then sailed from Brittany to Stromness in Orkney. There, another partner, the European Marine Energy Centre (EMEC), provided help including the undersea cable linking the centre to the shore. The presence of EMEC, with its expertise in renewable energy and its knowledge of the seas around Orkney, was one factor behind Microsoft’s decision to choose this location. “We’ve got so much renewable energy here,” says EMEC managing director Neil Kermode. There has been growing concern that the rapid expansion of the data centre industry could mean an explosion in energy use. But Emma Fryer, who represents the sector at Tech UK, says that fear has been exaggerated. “What’s happened is we’ve had the benefit of Moore’s Law,” she says. The continued advances in processing power have made doom-laden predictions look foolish, Ms Fryer says. Nevertheless, she accepts there is a challenge as the industry continues to expand and she welcomes experiments such as Microsoft’s. “It’s really exciting that they are thinking this radically,” she says. Ms Fryer also thinks situating data centres near to or under the sea is a good idea. Another expert is not so sure. Prof Ian Bitterlin, a data centre consultant for nearly 30 years, is sceptical about the environmental impact of going underwater. “You just end up with a warmer sea and bigger fish,” he says. And 90% of Europe’s data centres are in big cities such as London and Madrid because that is where they are needed. Microsoft’s Ben Cutler insists the warming effect will be minimal – “the water just metres downstream would get a few thousandths of a degree warmer at most” – and the overall environmental impact of the Orkney data centre will be positive. As we bobbed about on a boat just above the site where the data centre was to be sunk the following day, I put it to him that many people might think the whole venture was a bit crazy. Now, the Project Natick team will monitor the data centre for the next five years. It could turn out to be a signpost to the future – or maybe just a tourist attraction for passing fish.